Method of wearing: Attached to shoes with shoelaces. 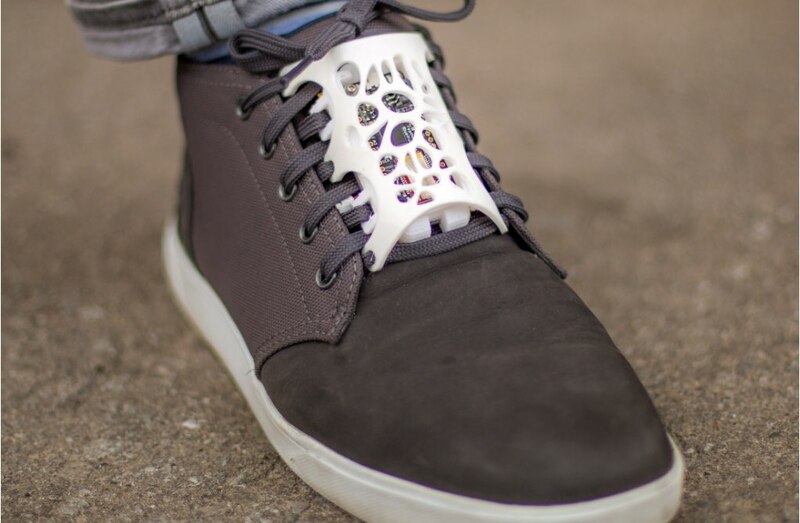 The Feather Shoes demonstrate an option for wearing electronics that’s available to almost everyone without the need for specialized garments or attachments, by lacing the components into the shoe with shoelaces. Feather shoes use a hybrid approach to encasing electronics on the feet. 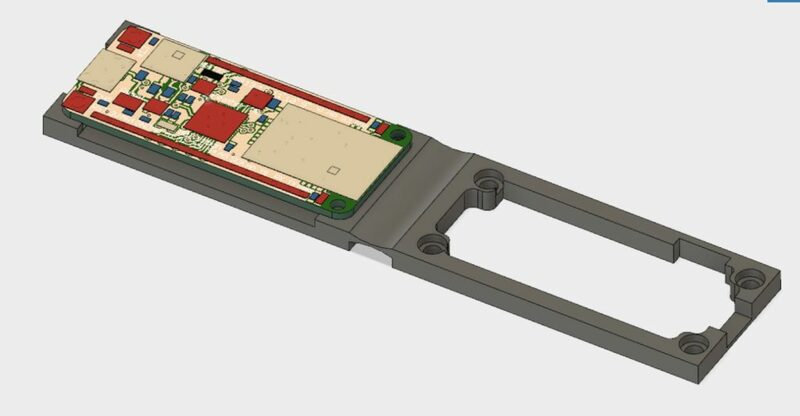 The rigid case offers the microcontroller and battery some protection from bending, while the flexible cover accommodates different shoe sizes and protects from bumps and damage without the need for a heavy or uncomfortable enclosure. 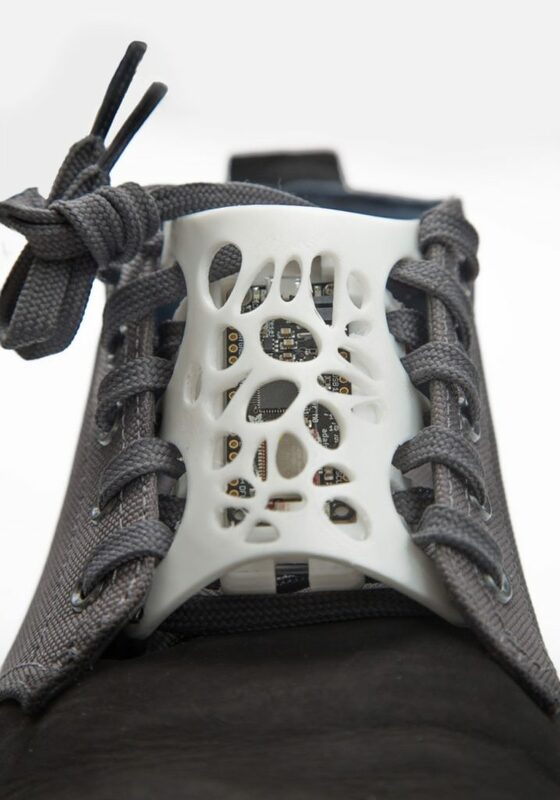 What is an optimal location for a shoe-mounted microcontroller? Can we fit multiple users’ feet? How can we avoid a conspicuous, uncomfortable and boxy enclosure? During the concept generation phase, we hit upon the central location on the midline of the foot, using shoelaces to attach components (see fig 5). Making this attachment possible without the need for tools or permanent modification to the shoes seemed like a good idea as well. We did not try to make the enclosure air or water tight, and it offers only moderate protection from dirt and impacts. This enclosure does not provide enough protection for everyday wear or high reliability applications. We found the design as built to be comfortable and lightweight. It didn’t create any problems for standing and walking. The rigid base of the enclosure was 3D printed from PLA. This was a good choice for prototyping, but offers only moderate strength. The same design could have been printed in ABS or polycarbonate (PC) for greater impact resistance and strength. The rigid enclosure was sized to accommodate a moderate-to-high capacity 1200mA-h Li-Poly battery. The ornamental design of the flexible outer case was designed with the help of a free plugin for Autodesk Fusion 360 called “Voronoi” v.1.1.0 by Hans Kellner, available from the Fusion 360 extension gallery. It was used to produce the holes in the top surface, which increase flexibility and reduce weight. 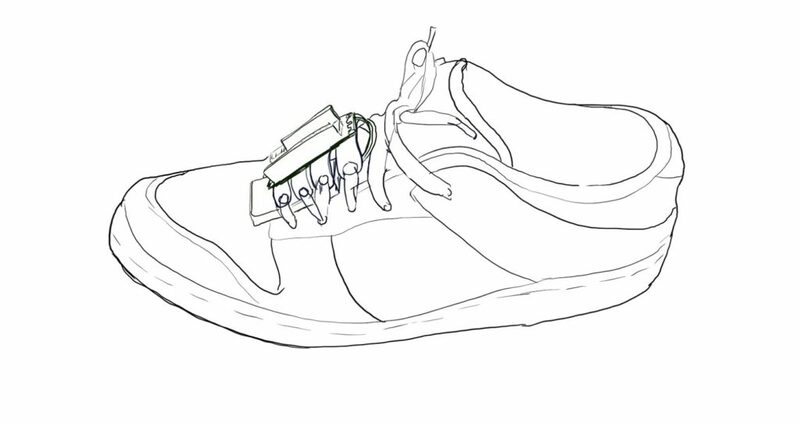 The spacing of the holes for shoelaces was optimized for a pair of shoes on hand, but can be flexed or, if necessary, adjusted in CAD for other shoe sizes. During an earlier phase of this project, we experimented with 3D printing three different TPU filaments: Ninjatek’s Ninjaflex, Semi-flex and Cheetah filaments. Figure 3 shows the elastomeric case produced for the Circuit Playground Express. 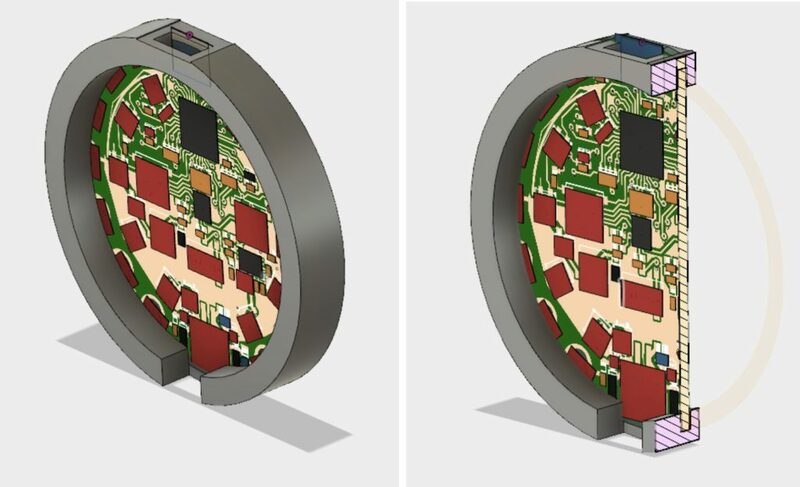 It is attached by stretching it over the circuit board like mounting a tire to a rim. Cheetah is, by a small margin, the stiffest of these three filaments, but easiest to print by far. It was printed with the same process variables typically used for PLA, and only slightly higher print temperatures. We had also experimented with PETG filament to make living hinges for a Feather case which folded together from one piece (fig 4). Fig 4. CAD model of Feather M0 case (grey) based on a living hinge. The right hand portion folds over the left hand portion with the circuit board and screws closed. Based on our various materials tests, we decided to use Ninjatek’s Cheetah filament to make a flexible cover for the Feather shoe. In a separate project, this material held up in an outdoor application exposed to winter weather for several months. Our first approach (fig 5) used the shoelaces to attach the feather, but offered no protection for the battery or circuit board. The rigid case was added to protect them. After a quick design review, the upper and lower cases were developed. They fit well when printed and didn’t require modification to mount well. It was a bit time-consuming to lace up, but comfortable to wear. We were favourably impressed with the appearance and performance of the Cheetah TPU housing. It seems particularly useful for wearables projects where a degree of flex and stretch can be added to increase accommodation and comfort. Adding holes keeps it cool to wear and adds a bit of visual interest.